Spicy. Chili. Oil. Noodles. 'Nuff said. 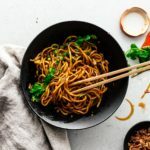 This is an unbelievable quick and flavorful bowl of noodles that you can literally throw together in under 5 minutes. As any good Chinese kid knows, noodles are the solution to ALL hunger situations. 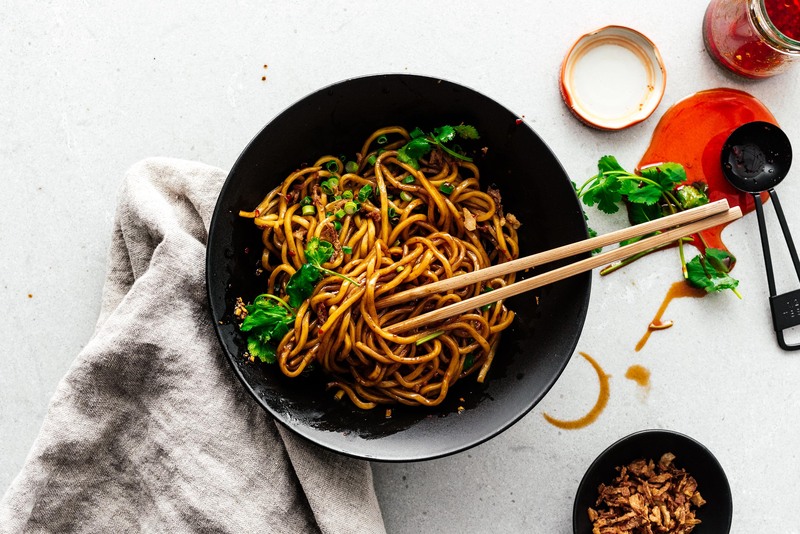 Growing up, there were always, always noodles in the pantry, as well as a plethora of sauces. Mike and I have kept that tradition. We pretty much have an entire shelf dedicated to noodles. And not just dried noodles. Nope, we also have a crazy amount of fresh noodles in the fridge and freezer as well. 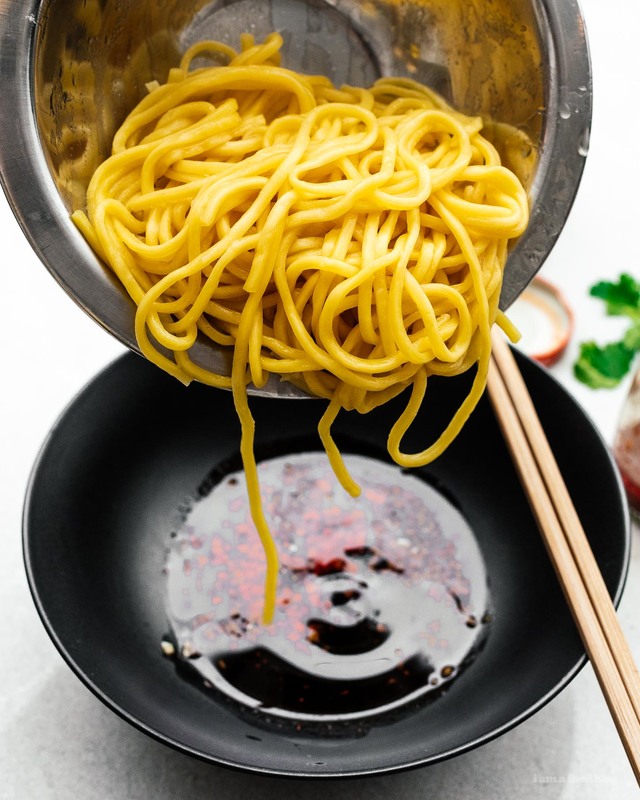 One of the best ways to enjoy noodles, in my humble opinion, is with chili oil. Spicy, savory, tangy…just plain good. Make sure you’re using a good chili oil, one that you like the flavor of. We typically make our own (recipe coming soon) but a good bet is Lao Gan Ma, or Old Godmother, sauce. You can find it at the Asian grocery store, it’s the jar with the red lid and a severe looking lady on the label. I recommend the chili crisp sauce, which has delightfully crunchy chili flakes in it. But, as always, go with your favorite. 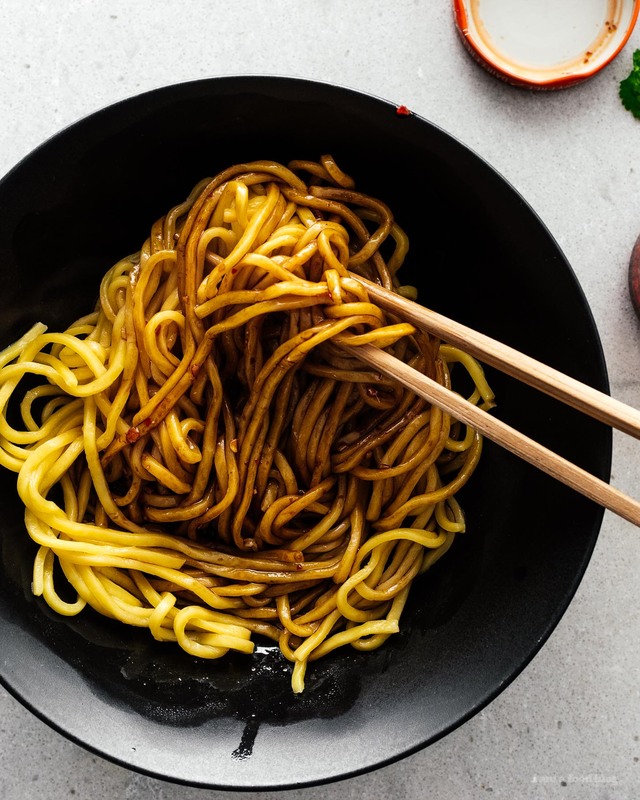 Chili oil, mixed with raw garlic for a hit of fresh punch, a mix of dark and light soy sauces for flavor and color, sesame oil for a rich nutty roundness, and Chinese black vinegar for a tangy kick means that these noodles are here to say. Forever. 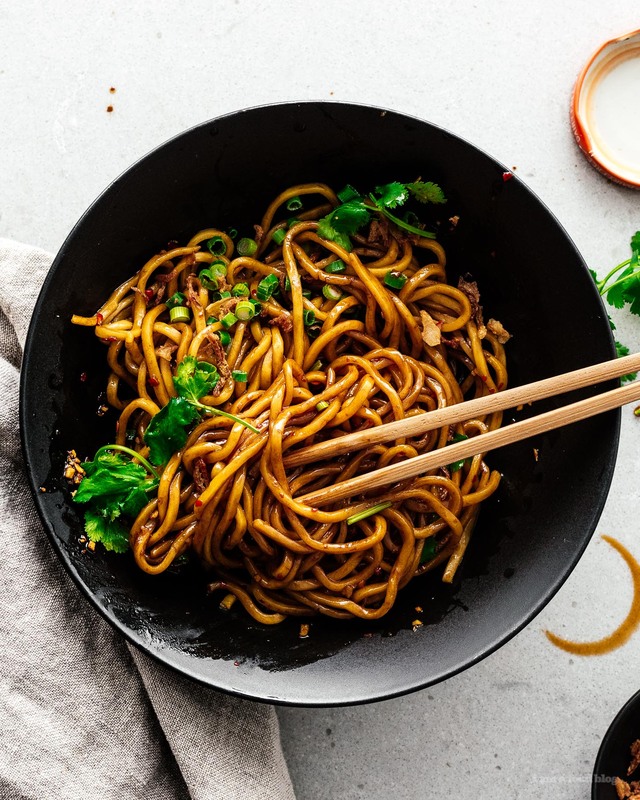 Note: I used oil noodles (find them in the fridge section of your local Asian grocery store). Oil noodles come can come cooked or raw, I used the cooked ones and just briefly heated them up in boiling hot water. This recipe works well with use any noodles you like, including pasta. 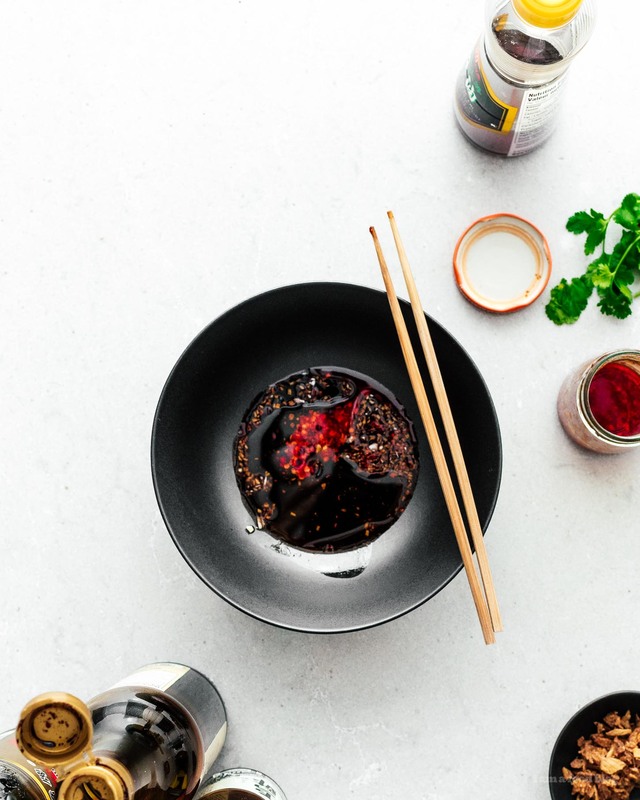 In the bowl you’re going to eat in, mix together the garlic, soy sauces, chili oil, sesame oil, and black vinegar. Cook your noodles according to the package and drain. Add the noodles to the bowl with the sauce. 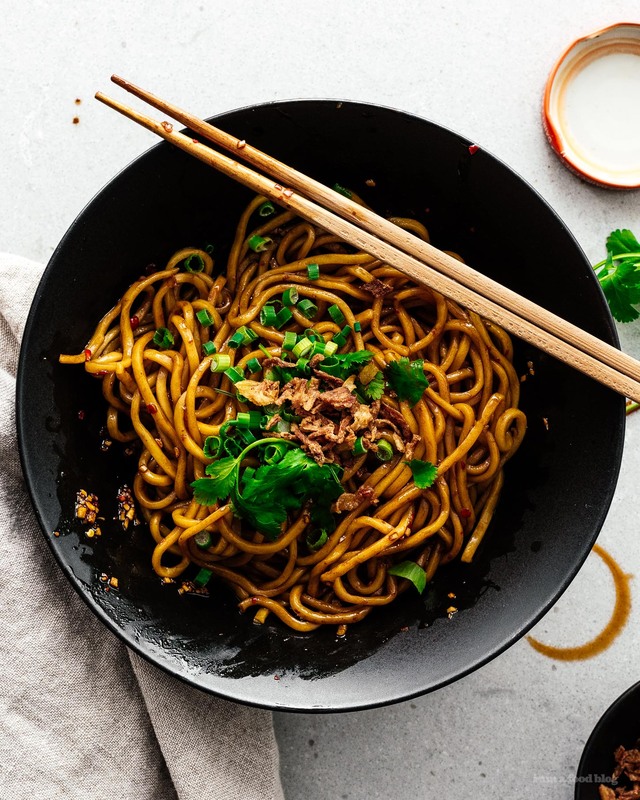 Toss well and enjoy with green onions, cilantro, and crispy onions, if using.